“I will protect you, my love. We can do it in seven days, tops. One day to register, and then we are back here before the winter solstice. Let’s say it takes two days to get through the registration lines—I’ve got an extra coin or two to help the tax collectors see us quicker.” He winked at her and grinned that broad grin that always stole her heart. He squeezed her hand, “I promise, everything will be fine.” He reached out and touched her belly, and the baby kicked its greeting from within. She remembered that night when she saw the angel—the one who told her she was going to have a child. 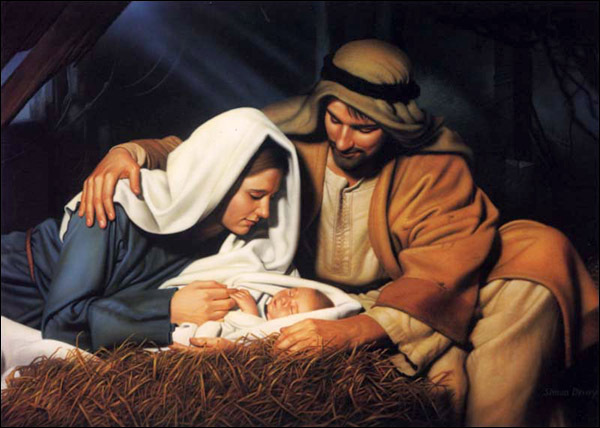 She thought about his strange words: that this child was going to be holy and be called the Son of God. She remembered her father reading the old stories on the Sabbath where the kings were called “sons of God.” Every girl dreamed of having a son who would be a king, but could it be that this dream was real? Could it be that her son really was going to be a king? They started off the journey moving quickly, but by the end of the first day, Mary had slowed down. Seven days stretched into ten and then eleven. Their money was running out and there was still another full day ahead. Determined to have enough left to stay at the inn in Bethlehem, the past two nights they had slept under the stars. Or more exactly, under one star so very bright that it almost seemed you could touch it or that it could touch you. Mary wasn’t one to complain, but she couldn’t get comfortable, no matter how many clothes she tried to stuff under her swollen body. The sky was turning grey with morning and she had hardly slept at all. She felt as if a sword were being run through her, front to back. Joseph was watching her carefully as she slowly sat up, cold frost coating her clothes. She smiled weakly, trying to cover the pain. “I will be okay.” She struggled to stand, holding her hand to the small of her back. Joseph stood behind her, and kissed her neck. He rubbed her back and she snuggled up against him. They gathered up their belongings and set off, down the last stretch of road, through the Jordan valley, towards the little town of Bethlehem. “I think your people were shepherds before that and carpenters smell better!’ And they both laughed. Inside the city, the crowds were so heavy, you could hardly walk. It had been years since he had lived there, but he still remembered the way to the inn. He held Mary’s hand tightly through the crowded, winding streets. Joseph looked back for Mary. She was doubled over, against a wall. “Are you okay?” She stood up, and he could see that the front of her robe was wet. Her eyes were filled with panic. Mary lay, breathing heavily. Every couple of minutes, she gave a loud gasp. Joseph lit the fire, and waited for the rusty iron pot to heat. He sat next to her praying silently. She nodded, her teeth clenched. “It’s coming. It’s coming.” Her screams tore his soul in two. Joseph put his hands on the head of the little boy who would change the world. He pulled and Mary pushed and out came a tiny, red-faced child, who looked exactly like every other tiny-red faced newborn baby. Joseph wiped the baby’s face and kissed him. And then he kissed his wife. And both of them forgot how hard it had been, how poor they were, how cold and hungry. They just looked at this little naked, shivering, crying bundle of humanity and thought that he was the most beautiful child who had ever been born. The Christmas story is one of humanity’s most beloved, not because it’s Currier and Ives with snow and gas-lit torches and horses that know the way to carry the sleigh. It is one of our most beloved because it is the fundamental human story: a story of fear and faith, of promise and pain, of blood and hunger, of dirt and manure and sweat, of a desperately poor young couple who hold on tightly to their love for each other and to the dreams of their hearts. Every young husband swears to protect his wife, every young wife swears her devotion to her husband, but these two set off on a journey they should never have taken, if reason and common sense had ruled. But it was faith, not common sense that ruled. It was the sure conviction that God was at work in the world, and that no matter how hard that it was just to be alive, the bright star of promise would be shining. That promise of Christmas comes into the coldest, darkest times with a light so bright you can see it through your eyelids. Times like these. Times like tonight. It’s tough out there for a lot of folks. A lot of you have lost jobs this past year, or marriages, or spouses, or children, or houses—or maybe you’re hanging on by the very tips of your fingers and you’re afraid that it’s all slipping from your grasp. Maybe you’re here, grateful just to be warm, and sing songs that bring back memories of happier times. Christmas is a gift from God to you. This gift comes to remind us that, no matter how difficult things are right now, God is at work in the world. That doesn’t mean that people aren’t cold tonight, or hungry or sick or oppressed. It just means that, if we are ready to trust, God will pull us through. Mary and Joseph didn’t get a room that night, a room they desperately longed for. But they got a walloping dose of God that night, along with a baby they tried to keep hushed up in rickety wooden manger. They longed for a place to rest and they got hay, chickens, cattle and sheep. They longed for a break,a respite, a little sip of wine, a hunk of bread. And just when they wanted to close their eyes and hold each other on the cold, straw covered ground, the whole place filled up with wild-eyed men who smelled like goats, shouting about choirs of angels and a baby who was Christ the Lord. Mary and Joseph didn’t quite understand the whole story just then, but they knew something wonderful had happened to them. So they lifted a candle over the feed trough and pointed to the tiny child dreaming of a world where no one was hungry, no one was alone, there were no wars, no broken families, no broken countries, no people stuck out in the cold because there was no room for them anywhere else. And the shepherds rejoiced. Because in a cold, dark cave, on a cold, dark night, they had seen the brightest light of all. Tim, I love this! You were there, too, weren't you? 🙂 Blessings to you and yours always. The family in the picture are happy.I love this scene.